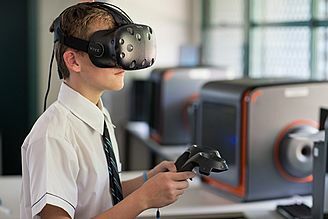 Calamvale Community College (CCC) is a P-12 Independent Public School, located close to Brisbane, the Gold Coast, University of Queensland, QUT and Griffith University, as well as Southside Asian communities. The College, with a population of 2100, is multicultural in nature, with students representing over 60 cultures and speaking more than 20 languages. CCC has many state of the art facilities, including an auditorium/performance space that seats 200, cutting-edge STEAM spaces, a 3-court sports centre and an internationally-minded library. 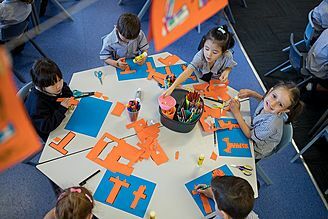 Calamvale Community College is an authorized PYP school. The Primary Years Programme engages our learners from Prep to Year 6 in six transdisciplinary units of inquiry. The College’s purpose closely aligns to the philosophy of IB, in delivering outstanding educational outcomes where our people are: creative and critical thinkers; problem solvers; citizens of the world. Through a student centered and inquiry based approach to teaching and learning, our teachers are focused on the development of global citizens who are curious, creative and clever members of the community. Our commitment to a P-12 Positive Education philosophy adds greater strength and relevance to the development of the Learner Profile across the College as well as responding to the social and emotional wellbeing needs of our students. 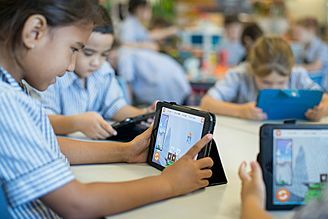 The IB philosophy strongly aligns with the College’s vision and focus of creating a better world through education by fostering the cross-cultural awareness and sensitivity of its students, providing them with increased opportunities to pursue international study and career options, and connecting students with the global community. The IB complements our existing student curriculum, bolsters the breadth and depth of our extra-curricula activities, foregrounds the importance of second language acquisition with Ab Initio subjects, and deepens our commitment to community service projects through the CAS Program. 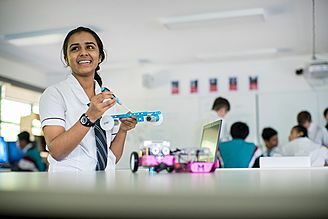 The College offers a range of subjects, including multiple Language A and B options, and a spectrum of Sciences, Individuals and Societies and the Arts. 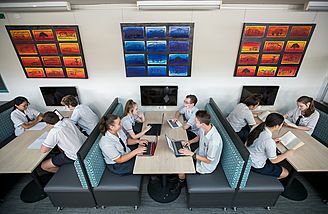 We are strongly committed to the IB philosophy and have developed unique learning spaces with small class sizes and a Core program that is underpinned by the College’s focus on Positive Psychology and wellbeing. Calamvale Community College is an authorized DP school.